Looking at the site, I think you can see that I LOVE color. I used to be stuck in a black, brown and white phase but from the moment I put on my first POP of color, I ran like a sprinter with it. However, orange was one of those colors that I thought I could never wear. I always thought that I was too orange for orange. I couldn't have been more wrong. One day I put on an orange tank top and my world changed. Another parameter that I placed on myself was shed and I got that much closer to being fashionably free. Dang. That was deep. You are just talking about orange Alicia. Calm down. Story short: try everything! After all, you never know until you try (there I go getting deep again). Orange you glad to see these options (I know, corny. I had to do it lol)...which one (or ones) tickle your fancy? ISABELLA STRAPLESS MAXI DRESS IN TANGERINE from Height Goddess. $129. 62" and 67" length. Sizes S-XL. Also comes in black and turquoise. CANDY SKINNY JEANS IN ORANGE from PZI JEANS. $79. Regular to x-long lengths (38" length). Sizes 4-18. Comes in 6 other colors. TALL RUFFLED KEYHOLE TANK IN ORANGE from Old NAVY. $15. Sizes S-XXL. Comes in 7 other colors. TALL PRINTED FRILL PLAYSUIT from Next. $47. Sizes 4-14. WRAP MAXI SKIRT from Long Tall Sally. $95. 44" long. Sizes 6-8. Also comes in tropical green. TALL DANCING BLOOMS PRINT SKIRT from Ann Taylor. $88. 22.5" long. Sizes 0-18. MILSBTWN from Nine West. $109. Sizes 5-12. UO CAT-EYE RISKY SUNGLASSES at UrbanOutfitters. $14. MATERIAL GIRL EAR LACE at Candid Art. $32.30. TALL SMOCKED DRAWSTRING NECK KNIT DRESS at Loft. $49.50. HURRY! Hot item. Only sizes L and XL left. KATE SPADE NEW YORK FINGERS PRINT BON SHOPPER at Zappos Couture. $198. Also comes in black and red print. STRIPE TANK TOP at Long Tall Sally. $35. 30" length. Sizes Extra small to extra large. Also comes in multi. TALL STRAPLESS DRAWCORD DRESS at Gap. $59.95. Sizes S-XL. Also comes in 3 additional colors. TALL NEON LACE DRESS at TopShop. $75. Sizes 8-14. KATE SPADE DOTZ BIB NECKLACE at Piperlime. $117.99. DISTRESSED FAUX STONE BRACELET at Forever 21. $6.80. HOLLAR TOTE at Aldo. $45. GRADIENT RING at Banana Republic. $45. STEVE MADDEN TRACY FLAT at Barefoot Tess. $59. Sizes 11-14. WEWANTIT T-STRAP SANDAL at Endless. $79. Sizes 5-12. Also comes in 2 additional colors. Spring and Summer. Two of my favorite words. They bring warmer weather, summer lovin (watch out now), vacations and one of my personal favorites, new fashions! This year spring and summer is all about color and print. From bright and bold to cool, both are taking over. The key to using color and print successfully is finding what works for you in the right garment. You should never have one without the other. For example, you may look good in an orange tribal print but if the garment makes you look 10 times bigger than you are, you will be the girl in orange tribal print that looks ten times bigger then she is. Capiche? Below are some options and trends for Spummer. I think you would look HOT in all of them but feel free to pick and choose based on YOU:) Have fun coloring! Try not to stay in the lines. COLOR. COLOR AND MORE COLOR. Use it to compliment YOU. 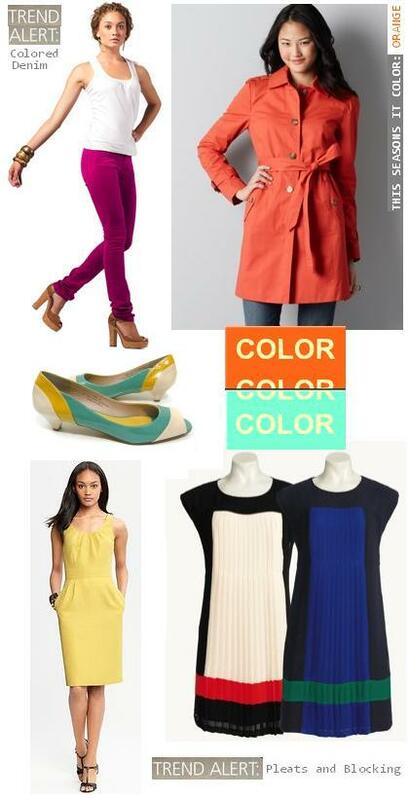 TREND ALERT: Color blocking is a great way to showcase color. Colored denim adds just the right amount of color and pleats make color unique. DON'T FORGET THE ORANGE. It's the "IT" color for spummer. HEATHER SKINNY JEAN IN COLOR at HeightGoddess.com. $129. Comes in magenta, royal blue and dark mocha. Sizes 26-33. Inseams 37" and 39". TALL COTTON TRENCH COAT IN PICNIC ORANGE at Loft.com. $129.99. Sizes XXS-XXL. 38" long. Also comes in deep khaki. B.F.T BY BAREFOOT TESS SANTA BARBARA HEEL IN GREEN at BarefootTess.com. $79. Sizes 11-14. 1" heel. Also comes in red and black. CHARTREUSE JACQUARD DRESS at BananaRepublic.com. $140. HOT ITEM. Going fast. Sizes 4, 8 and 12-16 left. 42.5 inch length. PLEAT COLOUR BLOCK SHIFT DRESS at NextDirect.com. $87. Sizes 4-14. 37" length. BOLD AND THE BEAUTIFUL. Make a statement by simply walking into a room. This season, the bolder the print, the better. Don't go overboard. Prints shouldn't have a party. Stick to one and let it shine. Tribal is popular but animal is still in the "cool" crowd. GEO PRINT TUNIC at NextDirect.com. $66. Sizes 4-14. 38" length. STEVE MADDEN TAILOR FLAT IN TAUPE MULTI at BarefootTess.com. $49. Sizes 11-13. Also comes 7 other colors. TALL AZTEC PRINTED LEGGINGS at TopShop.com. $32. Sizes 8-16. PEACOCK FEATHER PRINT MAXI DRESS at LongLegs.ca. $117. Sizes S-XL. 60" long. DOT YOGA JACKET BY BYLYSE at LongTallSally.com. $135. Sizes small to extra large. 26.5 inches long. GWYNETH PAISLEY at ExceptionalFootprints.com. $139. Sizes 11-14. LEOPARD SEQUIN TOTE at WindsorStore.com. $26.90. TALL NATIVE BLOCK LEGGINGS at TopShop.com. $32. Sizes 8-16. KAREN KANE LEOPARD SKIRT at SimplyTall.net. 38" long. Sizes S-3x. SHOW OFF YOUR UBER FEMININE SIDE with these floral print specials. Floral from head to toe is a NO NO. Friends don't let friends look like a flower stand. Flowy shapes and materials also go well with the floral motif so it's a great way to incorporate the laid back, easy flow styles that will be everywhere this season. COTTON SATEEN FLORAL BRIGHTS DRESS at LongTallSally.com. $119. Sizes 6-18. 45.3" long. Subtle pleat detail. NINE WEST AMPED UP WEDGE PUMP at Endless.com. $89. Sizes 5-12. Comes in 7 other colors. BALLASOX PRINCE BALLET FLAT IN FLORAL at BarefootTess.com. $49. Sizes 11-14. Also comes in coral, platinum and royal. TAMARA FLORAL TOP at BananaRepublic.com. $79.50. HURRY! Only XS-M left. Hits at lower hip. FLORAL PRINT RACER BACK TANK IN NAVY FLORAL at OldNavy.com. $17.50. IN DEMAND. Only S, M and XXL left. Comes in 5 additional floral prints. TALL MOTO CHINTZ FLORAL JEAN at TopShop.com. $71. 36" inseam. FLORAL FRINGE SCARF at Forever21.com. $8.80. YOU ARE SUCH A SOFTEE. Soft hues are making apperances everywhere. Think of them as a soft slap in the face. LOLA TANK MAXI DRESS IN HEATHER GREY at HeightGoddess.com. $129. 62" and 67" inseam. Sizes small to extra large. Also comes in black. Belt not included. KAREN KANE TIE DYE COLD SHOULDER SHIRT IN AQUA at SimplyTall.net. $74. Sizes S to XL. TREND ALERT: Asymmetric hemline. TALL CURVY ROLLED CUFF STRAIGHT LEG JEANS IN COTTON TWILL at Loft.com. $59.50. Sizes 24-30. ELANA BY ROS HOMMERSON at LongTallSally.com. $109. Sizes 10-13. TRISH TEXTURED DRESS at BananaRepublic.com. $130. Sizes 2-16. Skirt portion length is 23.5" long. MERCER V-NECK POCKET T IN GREEN STRIPE at Gap.com. $22.95. Sizes S-XL. Also comes in 4 other colors. BOYFRIEND ROLL-UP SHORTS IN HEATWAVE ORANGE at Gap.com. $39.95. Sizes 4-16. Comes in 8 other colors. 11" inseam.